One of the basic fundamental rule is that you cannot increase the brightness of a light source. This is equivalent to the basic thermodynamic principle that you cannot decrease the entropy of a system. Any light source has a fundamental characteristics called its "etendue", which is the product of its emitting area and its emitting solid angle. The brightness of the source is then defined as its emitting power divided by its etendue. Another fundamental rule is that the propagation of light has to respect the symmetry of time. If light goes from point A to point B, you should then be able to retrace the propagation from point B to point A. When you try to couple a light source into an optical fiber, it is the same as trying to couple the fiber to the light source. Ideally, you can get perfect coupling if you can match the etendue for both the light source and the fiber (which you can also call an emitter and a receiver), or if the emitter has an etendue smaller than that of the receiver. For a LED, the etendue is quite large, as the emitting area of a "surface emitting" LED is typically of the order of 200 or 300 micron square, and its emitting angle is close to 360 Deg (or 180 by placing a mirror surface underneath, which is typically inherent in the fabrication of a LED). For a typical telcom MM fiber, the receiving surface is its core, about 50 or 62.5 micron diameter, and the receiving angle is about 12 Deg (taking 0.2 NA). Its etendue is can be MUCH smaller that the LED. So the best one can achieve, NO MATTER WHAT OPTICAL SYSTEM YOU USE, would be to directly put the tip of the fiber directly onto the emitting surface of the LED, where the light emitted by the LED is the brightest. THIS IS EXACTLY THE SAME AS IMAGING THE LED SURFACE DIRECTLY ON THE TIP OF THE FIBER WITH A PERFECT IMAGING RATIO OF 1-TO-1. Given this, there are different ways to re-image a source. The standard way used in photography is to have a single lens (this can be a multi-element or compound lens). Another way is to use a pair of lenses. This is commonly used for a point-to-point imaging, as it is easier to correct aberrations in this case. The imaging ratio (scaling of the image size) is then directly determined by the ratio of the focal length of the lenses used. Coming back to the case of a LED (high power or not) which has already an integrated lens, this lens is automatically set for optimum collimation, EVEN IF THE EMITTING ANGLE IS OF THE ORDER OF 15 DEG (there is no such thing as a perfectly collimated beam, even for a perfect purely Gaussian laser beam). 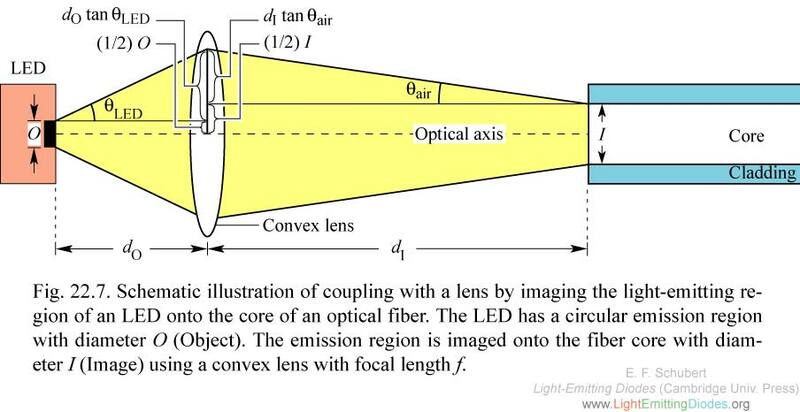 The emitting angle after the lens is determined by the size of the LED emitting surface and the focal length of lens. So for the case of the LED with integrated lens, one just needs a SINGLE LENS to re-focus the beam into the fiber. This lens should "IDEALLY" have the same focal length of the first lens integrated with the LED, but it is not very critical at all, there is a lot of wiggle room here. If its focal length is not knows, one can only make an approximation, and it should be good enough. For the LED with NO integrated lens, then you need 2 lenses. One could also do with a single lens, but the aberrations would be worst, so it is best to use 2 lenses of equal focal length.